Looking for a simple but awesome party dessert? Look no further!! 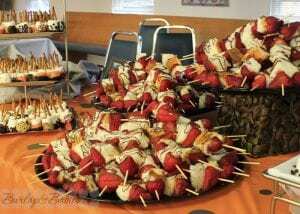 Angel food cake & strawberry skewers were a major hit at our graduation party. 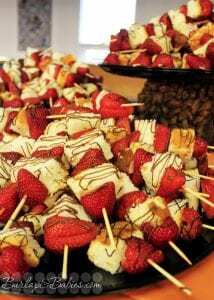 All you need is angel food cake, strawberries, some chocolate melts, and skewers. You can either buy the angel food cake already made from the store or buy a mix. I use Betty Crocker Angel Food mix usually. If you go the box route, while that’s baking you can be cutting all your strawberries in half. You can skip the cutting if you think your guests have big mouths but just to be safe I would usually cut them in half so you don’t get stuck in that awkward situation where you go to talk to someone and they had just stuffed a whole strawberry in their mouth. 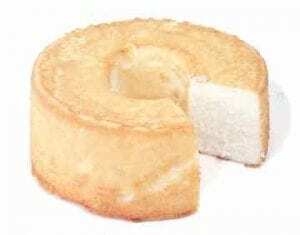 Once your angel food cake is baked and cooled, cut it into about 2×2 pieces. I would slice parallel to the table twice and then around the cake to get more uniform pieces. Once you have it all cut it’s time to skewer! I suggest laying out some wax paper on the table and as they get built lay them all out to make it easier to drizzle chocolate later. Next, grab your skewer and start alternating between angel food cake and strawberry pieces. I chose to have 3 strawberries and 2 pieces of angel food cake on each skewer. Once you’re done skewering them, melt down your chocolate melts and either put it in a squirt bottle or in a piping bag (or if you’re cheap like me, a ziploc bag and cut off the corner). Once the chocolate is melty, start drizzling over your skewers and voila! Adorable angel food cake skewers that all your guests will be impressed with! These look like a great, light dessert! If I make these the day before the party and store in the refrig., will they stay fresh or will the cake get soggy? Thanks! 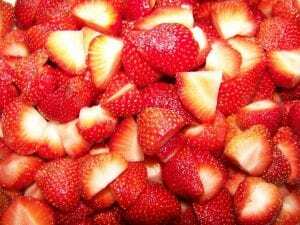 If possible, I would freeze the angel food cake and store the strawberries in the fridge. You can cut it all to prepare ahead of time but then assemble it all the day of. Would love to make these for my daughters graduation party. 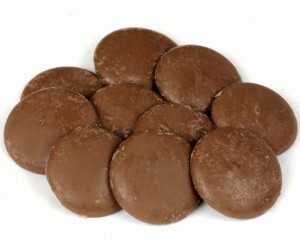 I am not food savy…how far ahead of time can I make these and how would I store them so they stay as “fresh” as possible. I appreciate your time, thank you!